The owner of Lambert Houses plans to tear down the complex and replace it with affordable housing and retail space, along with a possible elementary school. WEST FARMS — The Lambert House development in The Bronx could be demolished and transformed over the next 14 years if the property owner's plans come to fruition. Under the redevelopment project, the Lambert Houses — a group of buildings spread out across roughly 12 acres of land in West Farms near the Bronx Zoo — would be torn down and replaced with approximately 1,665 new units of affordable housing, 61,100 square feet of retail space and a possible new public elementary school for 500 students. If the School Construction Authority elects not to build the school, a residential building with 55 units will go on the site instead, according to the proposal. 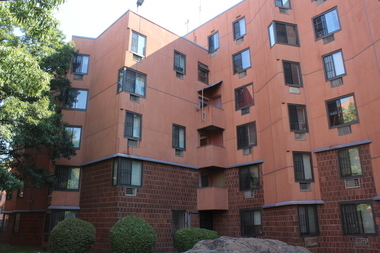 The complex, which is owned by Phipps Houses, currently contains five groups of six-story buildings with 731 residences and about 40,000 square feet of retail space. The city department of Housing Preservation and Development has been very critical of development's current layout, describing it as antiquated and dangerous, according to a document filed with the city. "The existing buildings were constructed between 1970 and 1973 and have outdated building systems," the agency wrote. "Furthermore, the configuration and circulation plan of the buildings, with multiple entrances and egresses, compromise building security by making control of access difficult." Officials hope to start work on the project in fiscal year 2017 and complete work on it by 2029. Although Lambert Houses would be torn down as part of the redevelopment plan, residents would not have to move out of the complex if they do not want to. Rather, they would be transferred to different buildings within Lambert Houses while their old ones are torn down, according to the scoping document. "Once relocated, the unoccupied buildings would be demolished and construction of new buildings would proceed," the plan reads. "Tenants of the next buildings to be demolished would be relocated within the Lambert Houses Project Area to the newly constructed buildings, and the demolition and construction process would begin again." Phipps Houses declined to comment on the plan, while residents offered mixed reactions to it. "It's sad that they are tearing the buildings down because I grew up here my whole life," said 26-year-old Gary Talamone, who has lived in the development since he was three. "It's gorgeous how they built it. It's a peaceful neighborhood." Resident Ana Serrano, 42, was less sympathetic to the houses in their current form and maintained that the development could look much nicer than it does now. "I don't mind the changes," she said. "I think that it could use some changes up in here." Anita Molina, 66, has lived in the development since 1976 and described tearing down the buildings as a bittersweet moment. However, she said that the community was calm about the changes overall, apart from the occasional fear that they might be forced to leave. "They claim that nobody is going to have to move," she said. "That's the only thing I hear around the neighborhood that people are worried about."